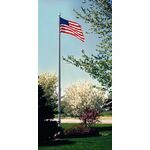 These deluxe Internal halyard flagpoles contain a self-locking and maintenance free "M" winch mounted inside the flagpole shaft, operable only with a removable crank handle. A stainless steel cable unwinds from the winch that passes up through the inside of the poles shaft. A counterweight attaches to the retaining ring, which allows the halyard to be lowered effortlessly.